Hugh Laurie in Montreal or Quebec City? Inform me about the next events for Hugh Laurie. Enroll yourself to our priority waiting list for Hugh Laurie to be alerted when new tickets are available. Filling this form doesn't engage you to any purchase. Hugh Laurie is coming to Montreal for a concert at Symphonic Hall of La Place des Arts, in Montreal, on October 21st, 2013. Better known as the actor who portrays Dr. House in the TV show of the same name, Hugh Laurie has many tricks up his sleeve. He recently released a jazz-blues album entitled Didn't It Rain. 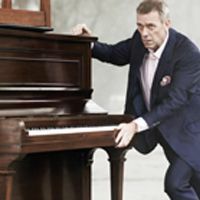 Don't miss Hugh Laurie's concert in Montreal this Fall !